As writers and journalists, we have an obligation to tell the story: accurately, completely and truthfully. Good writers don't have to embellish to make a story gripping. By being truthful and accurate in our reporting, the words tell the story. To do otherwise means we're no better than Fox News and The National Enquirer. We may as well skip the process of intervening and just write a bunch of crap about someone. Those are tenents of our profession and they apply to a New York Times reporter or a freelance writer like me—a middle aged woman who changed careers in her 40s, who's trying to build a reputation. As random as identity theft, a keystroke in one direction or another can impact someone's reputation, or worse, their career. This week I was the victim of someone whom I believed used me to try and revive her career by writing a bunch of lies about me. The worst part is that this wasn't on some Facebook thread. The salacious article was published on a well-known cannabis website. I belong to several online writing groups for women, non-binary and non-gender conforming. Our goals are simple: help each other succeed in an industry dominated by men. 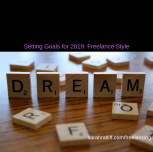 This can be in the form of offering advice when asked, giving the name of an editor at a publication, making suggestions to improve a pitch to an editor at a publication, being a cheerleader when we're plagued with imposter syndrome, and on occasion, commiserating when things in one's personal life are up in the air or even crumbling. 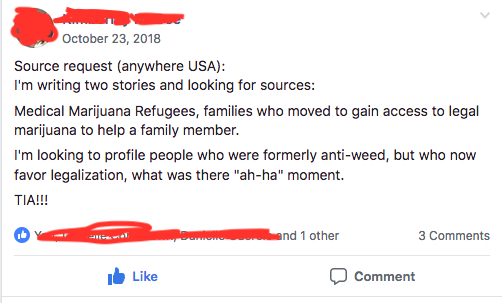 In one of these groups I saw a woman's post looking for Marijuana Refugees. I didn't really fit the description because while I do take advantage of living where it's legal to consume cannabis, we didn't move here for that purpose. But I answered it anyway. Pam* said she'd love to interview me, so I gave her my email address. She sent me three questions. I answered them and emailed her back. Q: What was your turning point or "aha" moment specifically? A: I’d say that aha moment came as I was writing articles for an addiction center. Doing research on an article, I came across so much conflicting information about pot. I continued digging deeper and realized the government has been lying to us about cannabis for as far back as I can recall (Richard Nixon’s War on Drugs is as far back as I went at the time). It then led me on a road to researching its benefits. This was in April 2015. States were legalizing it and it was also legalized in Puerto Rico in 2015, so my epiphany couldn’t have happened at a better time. Q: Do you favor certain kinds of weed or consumption or have any thoughts on restriction of weed consumption? A: I use cannabis for chronic pain, anxiety, migraines and insomnia. For pain I love AC/DC and Harlox—both are high in CBD and low in THC. Although I wasn’t using it for anxiety initially, a beautiful “consequence” of using strains high in CBD is that it reduces my panic attacks from several a day to just a few a month. For migraines I use only one: Mango Haze. For insomnia I like Moneymaker, Hindu Kush. I have only one thought on restriction: why? Seriously. It’s the one remedy that should be left up to the consumer to self-regulate. Nobody—not even my doctor—knows my body better than I do. Q: Do you favor social equity programs for marijuana? A: Yes, I can’t think of any off the top of my head but definitely. We talked on the phone once and I answered a few more questions about my cannabis consuming and I gave her a few articles from my portfolio. One talks about the way I was raised (in a family with a mother and two brothers who were/are alcoholics. One of them briefly used cocaine. When I was 13 or 14, my middle brother took cocaine laced with PCP (Angel Dust) and overdosed. At the time he was living with his girlfriend (now his wife) and her parents. During the overdose, he had what his girlfriend described as some kind of a seizure and then he stopped breathing. She and her parents rushed him to the hospital. He stayed there for two days. A CT scan and a spinal tap later, my brother was released from the hospital and given a clean bill of health. My parents used his overdose to drive home the point about the dangers of cannabis being a gateway drug. Fast forward to 2015, and I'm writing for an addiction center. In doing research for these articles, I came to understand how marijuana and drugs like heroin, cocaine, methamphetamines, etc. are very different and why it's a mistake to lump them in together. This is why I made a complete 180. My attitude about cannabis changed after I had my eyes opened. In the second article, I talked about the aha moment when I realized an entire generation was duped—thanks to former President Richard Nixon—into believing marijuana was addictive and as bad as heroin and cocaine. Thanks to this aha moment, I was able to stop using Vicodin, which I had for years, to treat my chronic back pain. I've never made any secret about my use of Vicodin. Hardly misuse or abuse though. A 30-day supply of the controlled substance used to last me 6-8 months. I'd forgotten all about the article until two nights ago when I received an email from Pam saying the article was published on a well-known cannabis site. Yay! I thought to myself. That was until I read it. The title seemed really awkward. Nobody outside of friends and family knows who I am, so I saw no need to use my name in the title. There were several incorrect statements, such as when my husband and I moved to Puerto Rico, but they weren't a big deal. However, a few things popped out at me that were out and out lies. Ratliff described her parents were high-functioning alcoholics who preferred to look the other way when their son, John*, began to smoke marijuana. Ratliff's brother's teenage rebellion and foray into drugs became a years-long debilitating spiral into heroin and other dangerous drugs. I have never described my father as an alcoholic—not in conversations with people or in my writing. I'm not sure where Pam got this. But worse, I have no idea where Pam got the impression my brother used heroin. I have never hidden the fact that his overdose on cocaine shaped how I view drugs. I think even he would say it's a stretch to go from snorting cocaine to shooting up dope. By the time he was 18, John had been in jail for heroin and other hard-drug use, leaving young Sarah to look after herself and her other brother Marcos* while her parents spiraled into depression and alcoholism. Apart from that, the only time I make reference to heroin in any article I've written or in conversation is when I talk about Marijuana being a Schedule 1 drug, "on par with heroin." For decades, Ratliff blamed marijuana for John's descent into addiction. She blamed him for fracturing the family beyond repair. I did? That's news to me. However, she had been downing prescribed drugs on a near-daily basis to alleviate pain from a serious fall that fractured her spine when she was 18 and living alone in New York City. After rounds of MRIs, ultrasounds, acupuncture, and yoga, the pain in her back continued to keep her from living a full life. She was on a continuous round of prescribed drugs, including tramadol, Neurontin, and Vicodin. I did fall in the bathtub and I did fracture my back (lower back). I was also prescribed Vicodin. I didn't start taking Tramadol until after my husband and I moved to Puerto Rico in 2008. I took Tramadol—as prescribed—for about four months. I stopped because it is easy to build up a tolerance to it and feel the need to take more. I stopped taking them after I read an article about their potential for misuse and addiction. I took Neurontin, also known as Gabapentin, for neuropathy. In 2017, after Hurricane Maria, I was diagnosed with cubital tunnel syndrome. My left ulnar became dislodged and it was bouncing around, causing atrophy in the hand and my left pinky and ring fingers to curl. I had surgery in December 2017. I wrote about my experience with Gabapentin in an article for The Fix. But the pain persisted. In 2009, she was diagnosed with degenerative disc disease and sacroiliitis, an inflammation of the sacroiliac joints. She continued to pop pills to get through the day. The pills only masked the pain. Between the section header Lapsing Into Dependence and Pam saying "she continued to pop pills to get through day" makes me sound like a Vicodin addict. The truth is a 30-day supply of Vicodin usually lasted me between six and eight months. I emailed Pam to ask her why she wrote the article she did. She didn't respond. I called her at home. She was slurring her words and I couldn't understand her explanation. At no time did she apologize or explain why she wrote such lies about my family and me. She said she would talk with the editor. Three hours went by and the article was still up. I remembered Pam had given me the editor's email address, so I could pitch the publication for an article. I contacted them and told them the article was full of lies. Almost as soon as I emailed the editor of the publication, the article came down. I received emails from both the editor and the chief of staff, both of whom apologized, and said they would investigate. Where Has Journalistic Integrity Gone? I think what was the most confusing to me in all this is why would someone who refers to herself as "an award-winning, nationally published columnist and freelance writer/editor," with bylines in The New York Times, Variety, People and more, need to resort to writing such a salacious piece of garbage about me? We're hardly on the same level. I am just now building a name for myself as a freelance writer. I have so few bylines to my name, and none of them as prestigious as The New York Times. I spent all day on Thursday on Google trying to find out as much as I could about Pam. Based on what I read, I speculate her career peaked between 2014 and 2016, when she had most of her bylines. After that nothing until late 2017 when she started doing content writing. This was her first piece with this particular cannabis publication and I am left to deduce she wanted to make a comeback, a splash and she used me to do it. I do think it was completely random. She didn't know me prior to my responding to her post in that writing group. Much as I would like to think it was personal, I don't think it was. It's kind of tragic in a way. I doubt Pam will ever get an opportunity to write for that cannabis publication. What I think happened was my story wasn't really all that compelling. Rather than just let me know, "hey, there's not much here (which I would have agreed with), I think I need to scrap it," she made up a bunch of lies about me to make it more exciting. But it backfired. So much for journalistic integrity. 11:53 p.m. Monday, January 21, 2019: I just received a cease and desist from Pam's attorney, who's probably her next door neighbor. It alleges defamation and that my blog (which on a good day doesn't get that many visitors) is impacting Pam's ability to make money. Conversely in Pam's article, she uses my full name several times and includes many lies—big lies, not white lies—my rebuttal does not name the real author of the article and it is 100% factual. I only wrote it in response to the article she wrote about me. I have been informed Pam is filing a lawsuit, in federal court, in her state against me. I consulted with my attorney and our response to Pam and her lawyer are: "Bring it on!" Disclaimer: The information contained on sarahratliff.com website (the "Service") is for general information purposes only. *Some names and identifying details have been changed to protect the privacy of individuals. Any resemblance to actual persons, living or dead, or actual events is purely coincidental.